After 30 years, the great debate rocks on: Kiss, or kiss-off? 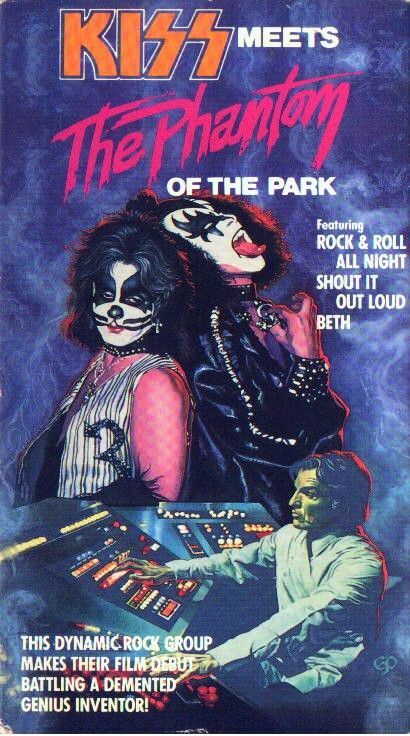 In the stinky-bad television movie “Kiss Meets the Phantom of the Park,” a mad scientist — lab coat, underground lair, sinister cackle, the works — sets out to destroy the world using the rock band Kiss as his unwitting agents. That’s odd. We thought Kiss was doing a pretty good job of that all by themselves. Apparently the scientist hasn’t heard Gene Simmons’ solo album or seen Ace Frehley without makeup. Kiss rules. Kiss reeks. You’re either on this side or that side. Being on the fence means you’ve checked out. It means you listen to Enya. After 32 years festooned in grease paint, chains, platform boots and yards of what might very well be tin foil, Kiss remains a great pop-culture polarizer, an easy critical bull’s-eye and delicious guilty pleasure, the worst rock band ever and the greatest rock band ever. The Michael Bay and P.T. Barnum of rock ‘n’ roll showmanship — kabloom, suckers — Kiss is just a typo for kitsch. Kiss-up. Kiss-off. A pair of upcoming shows spans this good/bad divide that Kiss has gleefully carved. The good is “Gene Simmons’ Rock School,” a droll and gimmicky reality show premiering tonight on VH1. The bad (wretched, ghastly, kill me) are multi-weekend screenings of “Kiss Meets the Phantom of the Park,” starting Aug. 26 at the Alamo Downtown. The professional hecklers of The Sinus Show are presenting the movie, lambasting it until it cries. Expect nothing less than a massacre. “Gene Simmons’ Rock School” is more proof Kiss will not die. Simmons — Kiss bassist, blood-spitter, boffo music mogul — crashes a classical music class of 13-year-olds at an English boarding school. Blustering and snarling with practiced disdain, a makeup-free Simmons arrives to tutor the rather stuffy kids in the ways of heavy-metal stardom. “To create little rock gods,” he says. Simmons, who is 55, roars, folds his arms and appraises the children through unbudging sunglasses. His scowly grimace suggests he has taken a whiff of the famous codpiece he dons on stage. “I wear more makeup and higher heels than your mommy does,” he taunts the crisply composed class. But of course they soon will. As in the Jack Black comedy “School of Rock” and the recent documentary “Rock School,” the show is about coming together for a collective purpose — in this case to open for metal band Motorhead — while learning how to cut loose and be yourself. Simmons even lets the kids in on a little secret: You can be a lousy musician and still rock hard and get preposterously rich. With “Kiss Meets the Phantom,” Kiss nearly met the Kiss of death. Premiering on NBC in October 1978, the band’s first and last movie casts its members — Simmons, Frehley, Paul Stanley and Peter Criss — as rock stars with murky supernatural powers. The bandmates are sort of like superheroes, but the movie is so badly conceived you can’t tell what they’re supposed to be. You have to be acquainted with the special edition Marvel comic books that star Kiss to make any sense of it. In the comics and the movie, band members become literal incarnations of their stage personas, going by the snickerable names Star Child (Stanley, who has a star over one eye), Demon (Simmons — lizard tongue, bat wings), Cat Man (Criss — painted whiskers) and Space Ace (Frehley — more silver sequins than a Broadway musical). The evil scientist (Anthony Zerbe, who was in “Cool Hand Luke” and “The Matrix Reloaded” and probably wishes this article would go away) kidnaps Kiss, builds robot replicas of the band and sends the imposters on stage to change the chorus of the Kiss song “Hotter Than Hell” to “Rip, rip/Rip and destroy,” which is supposed to incite fans to riot and ruin everything. That could be the lamest plan ever in the annals of mad scientists. So disastrous is “Kiss Meets the Phantom” that even the bandmates, who are not known to criticize their splendiferous empire, disowned the movie. Fans reconsidered their allegiance. Critics drove in on bulldozers. And a camp masterwork was born. The band has always targeted young boys, exploiting their fascination with science fiction and horror movies, comic books and fire. Forget childhood sports. Some of us were mesmerized by books and movies, the wide-open realm of the imagination, which happily accommodated the dual fantasy force of Kiss and “Star Wars.” It’s a few paces from a fire-breathing Demon to a growling Wookiee.